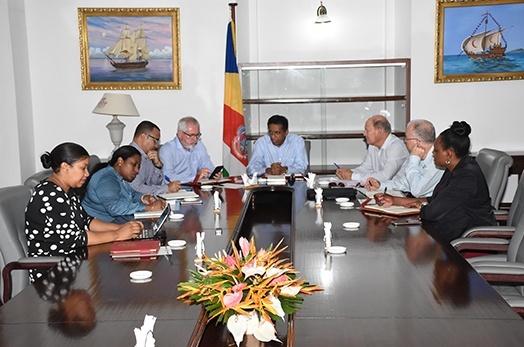 President Danny Faure chaired a meeting at State House this morning whereby he received an update on the status of six major infrastructure projects currently being developed in the country. These infrastructure projects follow on from the announcements by the President in his 2018 State of the Nation Address, whereby he detailed capital projects that are important for the development of Seychelles. There are six projects, among which two are already underway, namely the rehabilitation and extension of Port Victoria and the second sub-marine cable. The contract for the rehabilitation and extension of port Victoria has been awarded to a Consultant, who will work on its technical aspects before releasing for tender. This will be finalized by October this year. It is expected that this project will commence early 2020 and be completed in 2021. Secondly, there is the sub marine cable project which is at the Environment Impact Assessment (EIA) stage and to be completed by 2020. This second cable will provide an alternative route for connection in the event of an accident with its first cable. This project is being done in partnership with private sector. President Faure was also updated on four other Infrastructure projects which are at various stages of development, including the tunnel between Cascade and Grand Anse Mahé, the construction of a Dam in the district of Grand Anse Mahé, the reclamation of 5 areas around Mahé and Praslin and the construction of a new LNG Power Plant which generates electricity through the combustion of Liquefied Natural Gas (LNG). In view all these major infrastructure projects, the Public Utilities Corporation (PUC), which was represented in this meeting by its Chief Executive Officer, Mr Philippe Morin, will ensure that they have the necessary infrastructure in place so that when the demand for electricity and water rises, PUC is ready to meet the request in a reliable and affordable manner to their customers. Present for the meeting was the Minister for Finance, Trade, Investment and Economic Planning, Mr Maurice Loustau Lalanne; Secretary of State for Finance, Mr Patrick Payet; Consultant for Reclamation in the Ministry of Habitat, Lands, Infrastructure and Land Transport, Mr Patrick Lablache; and Principal Secretary for Economic Planning, Mrs Elizabeth Agathine.